Blog / News Dental Implants: The Better Tooth Replacement Option? At Paragon Dental, Inc., we believe in helping our patients achieve a strong, healthy smile so that they can live comfortably, and without the pain of tooth decay, the inconvenience of dentures, or the embarrassment of an unattractive smile. For many of our patients, that smile often comes in the form of dental implants. In a nutshell, dental implants are a safe alternative to crowns, dental bridges or dentures. They’re a tooth replacement, but are favored above all other options, because they look and feel just like your natural teeth. This is due to the fact that they don’t just sit on your exposed gum line, as dentures do, but rather, they “anchor” into the jawbone to take the place of your missing tooth root. Better yet, the jawbone and titanium root (for that’s what the artificial root is made of) go through a process called “osseointegration” once introduced to one another—meaning, the titanium actually fuses to the jawbone, becoming a part of you, essentially. A cap is then secured to the titanium root. This new tooth looks, feels and performs just like a natural tooth would. Maintain Anatomy: If you have missing teeth, your jawbone will begin to shrink over time, causing your jaw line to recede and your facial structure to change drastically. Dental implants stop the deterioration of the jawbone completely, helping your face retain its natural shape. Keep Your Teeth Healthy: A lot of tooth-replacement options, like dentures and fixed bridges, are bad for the gums, the surrounding teeth or both. Dental implants do not compromise any of your natural teeth. Security: The great thing about dental implants is that they don’t slip or move or become ill fitting. This eliminates common problems like gum irritation and pain from exposed nerves. What Does the Dental Implant Process Involve? Initial Consultation: During this pretreatment consultation, we’ll evaluate your medical and dental history, and determine if dental implants are right for you. 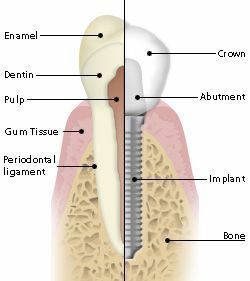 Initial Implant Placement: We’ll place the implant in your jaw and then wait for the bone to fuse to the implant over the next couple of months. Implant Prosthetic Attachment: During this phase, we’ll painlessly attach a prosthetic “post” to the implant. Then we’ll take an impression and have an artificial replacement tooth created for a natural restoration. Proper Care and Maintenance: We’ll teach you how to properly care for your implants so that they’ll last you a lifetime. Implants are the better tooth replacement option. If you decide implants are right for you, you can use them for everything from single tooth replacement to complete upper or lower tooth replacement. Dental implants can improve your appearance, boost your confidence and help you live your life comfortably and in great health. They look natural, feel natural and provide the same security as natural teeth. Our team at Paragon Dental, Inc. is happy to help you determine if dental implants are right for you. To set up your consultation today, visit us at http://www.paragondentalinc.com/contact/ or give us a call at 402-331-2070 today.